And when Jesus departed thence, two blind men followed Him, crying, and saying, Thou Son of David, have mercy on us. And when He was come into the house, the blind men came to Him: and Jesus saith unto them, Believe ye that I am able to do this? They said unto Him, Yea, Lord. Then touched He their eyes, saying, According to your faith be it unto you. And their eyes were opened; and Jesus straitly charged them, saying, See that no man know it. But they, when they were departed, spread abroad His fame in all that country. As they went out, behold, they brought to Him a dumb man possessed with a devil. And when the devil was cast out, the dumb spake: and the multitudes marveled, saying, It was never so seen in Israel. But the Pharisees said, He casteth out devils through the prince of the devils. And Jesus went about all the cities and villages, teaching in their synagogues, and preaching the gospel of the kingdom, and healing every sickness and every disease among the people (Matthew 9:27-35). 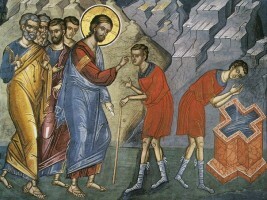 Today’s Gospel reading tells of the healing of two blind men. Every Gospel narrative, just as every word of the Gospel, conceals immeasurable meaning. This is because the Gospel speaks of eternal and timeless truths, of the eternal truth of life in God. Today’s Gospel reading likewise speaks of eternal truths that are of great importance to our everyday lives. It speaks of the love of God for man and of the love of man for God; of the fact that God never leaves us without His merciful assistance. Whatever may befall us, God will never leave us in either trouble or woe – if only we remain with Him through our faith in Him, our love for Him, and our fidelity to Him in our lives. Here come the two blind men of the Gospel, crying out: “Have mercy on us, Jesus!” They are very persistent. They know and believe in the power of the Lord Jesus Christ without any doubt whatsoever. 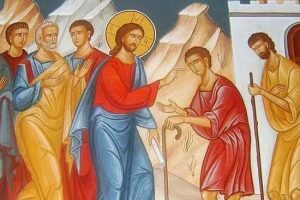 They follow Him into someone’s house, continuing to ask and plead: “Heal us!” The Lord asks them: “Do you believe in Me? 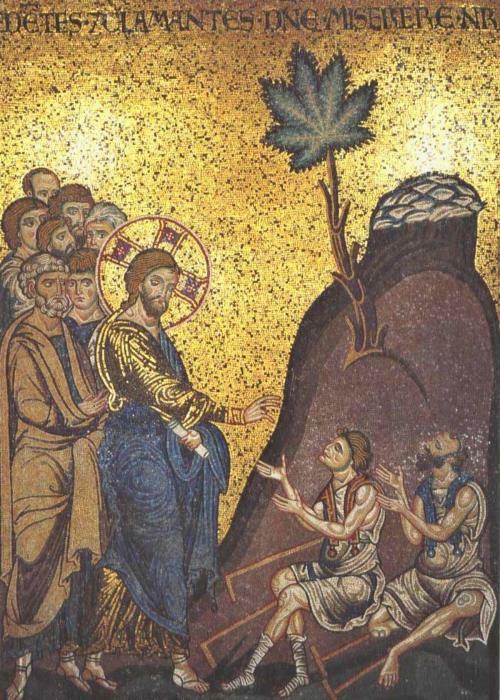 Do you believe that I am able to do this?” They reply: “Yes, Lord, of course we believe!” Then He touches their eyes and they are opened – the blind men recover their sight. We all resemble these two blind men in our spiritual blindness – and not in this alone. We resemble these ailing people, who were tormented by their infirmities, in both our spiritual and bodily infirmities, which torment us as did theirs; and in that, like them, we continue to ask for things from the Lord: for the alleviation of suffering, for our healing, for the return of our health and the joy of life, which we have somehow lost. But, brethren, we do not always resemble them in their faith in the Lord and in His power. We do not resemble them in their fidelity to God, which is not as strong and undoubting as that of these two blind men. Is that not why we remain unhealed? All our suffering – both individual and general – and all the pangs of life come about because we are under the control of the passions. It is they that compel us to work for sin, that is, for evil; it is they that rob us of the true joy of life. They extinguish the flame that gives true light and warmth to the heart. While initially they seem to add to our lives, they in fact devastate them. Disillusionment comes next, and the soul grows cold and hard. Without our noticing it, the passions turn us into cold, empty, lazy, calculating egoists. By giving into them we cripple both our own lives and those of the people around us. Alas, we give into them too easily, thereby obscuring the light of the image and likeness of God according to which we were created. But the passions can only overshadow the image of God in us, brethren, but not destroy it – for the image of God in man is indestructible. The passions in us are not all-powerful; their dominance, even over the very worst sinner, is not unlimited. The power of the passions over the soul can be overcome; the heart can free itself, becoming changed and sanctified. Everyone that has come into this world can be enlightened and illumined by that same Divine power that gave sight to the two blind men of today’s Gospel reading. This power is Divine grace, which is given to all who seek it. One only needs to seek it, to desire it with faith and love for God – and, certainly, with fidelity to Him in mind, will, and all one’s heart. Brothers and sisters, you have often heard sermons from this ambo concerning the teaching of the Holy Fathers of Christ’s Church about Divine grace. And who among you has not in fact experienced the action of Divine power to a greater or lesser extent? You know that it is by this Divine power, by this Divine energy, that man is made a partaker of the Divine. “We are partakers of the Divine,” in the wondrous words, familiar to you all, of St. Gregory Palamas. 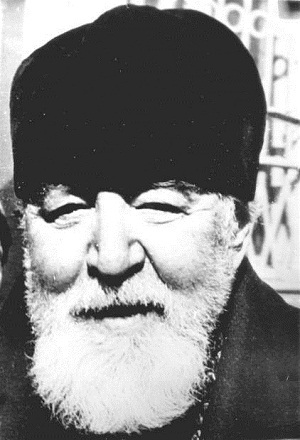 We revere him above all for his sublime and inspired teaching about the Divine energies, which disclose God to the world and unite us with God. But it is not enough only to know about the Divine power that abides eternally in the world. It is not enough to know about this even by experience, only in memory and the remembrance of the past; most likely each one of us has felt the grace of God momentarily touch our sinful hearts in miraculous manner. We need to want it unwearyingly and strive to acquire it actively, that we might be with God and in God; that the light of the image of God might never be extinguished in our hearts; and that true joy might never be taken away from us. Brethren, let us not despair and lose heart in the darkness of sin and evil that envelops our souls. Let us not imagine that darkness, sin, and evil – and the grief that accompanies them – are our inescapable destiny. No! God resisteth the proud, but giveth grace unto the humble. Let us endeavor to possess humility, and then God’s power will certainly raise us from the lowest depressions of our sinful fallenness. Let us try to acquire at least this one Christian virtue, and then we are bound to feel the wondrous action of His grace-filled energy illuminating our souls. These are the Savior’s words: To whom will I look, but unto the humble and the meek [Isaiah 66:2]. Let us try to become meek. Let us thus rearrange our relations with people, both near and far. Then the power of God’s mercy will not leave us and the power of Divine grace will not depart from us. It will unfailingly heal our infirmities of both soul and body. The Lord Jesus Christ walked the earth very long ago, healing every infirmity and disease in people, just as He healed these two blind men of the Gospel who had unwavering faith in Him. Now, too, the Lord Jesus Christ heals all who have faith in Him throughout the entire world with that same Divine power, granting them peace, true joy, and salvation. Let us believe Him, as the two blind men believed Him. Let us, brethren, be faithful like them in our faith and love for Him. And let us glorify throughout all the earth His most wondrous and majestic Divine Name. Amen. Delivered on August 12, 1956.